Continuing with the Harry Potter party posts, today we’ll deal with Eeylop’s Owl Emporium. I really wanted each child at the party to get an owl to take home, but yikes! The absolute best price I could find was for some cheap, very small owl plush toys at $1 apiece plus shipping. That would really take a bite out of the party budget since we were expecting up to 15 children at the party. 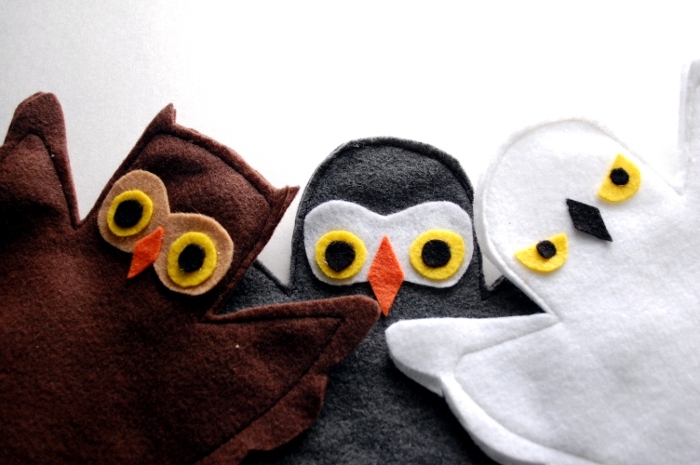 Instead, I decided to sew felt hand puppets. It was a bit time-consuming. I’ve written before about my method for making hand puppets. I used Max’s hand this time, since he would be one of the oldest children at the party. 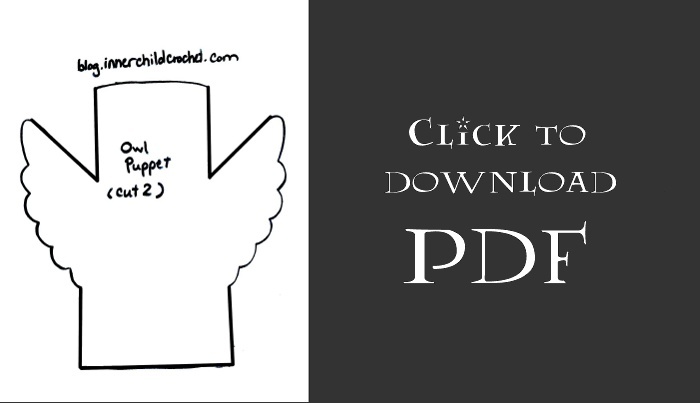 Since you may not have a child handy when you make yours – or perhaps you’re just not in the mood to draft your own pattern – I’ve made a printable one for you. I wanted there to be some variety, so I made four kinds. (I rounded the head for the snowy owls and the gray owls.) 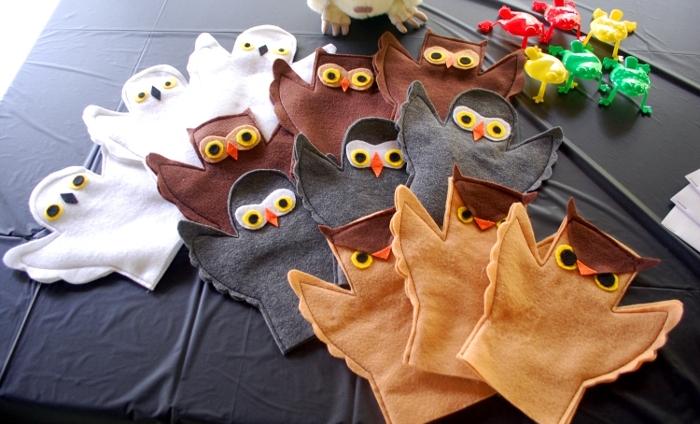 I was only able to get one pattern piece out of each piece of felt, but I decorated with scraps, so that meant that each owl puppet only cost me about fifty cents! You can see that I used my sewing machine and just made a basic outline of each instead of sewing around each feather. Also, I used a glue gun to attach the facial features. If I was making one or two puppets, for gifts, I would have sewn the pieces of the faces on, but since I was making a round dozen for party favors – glue gun. Whew! 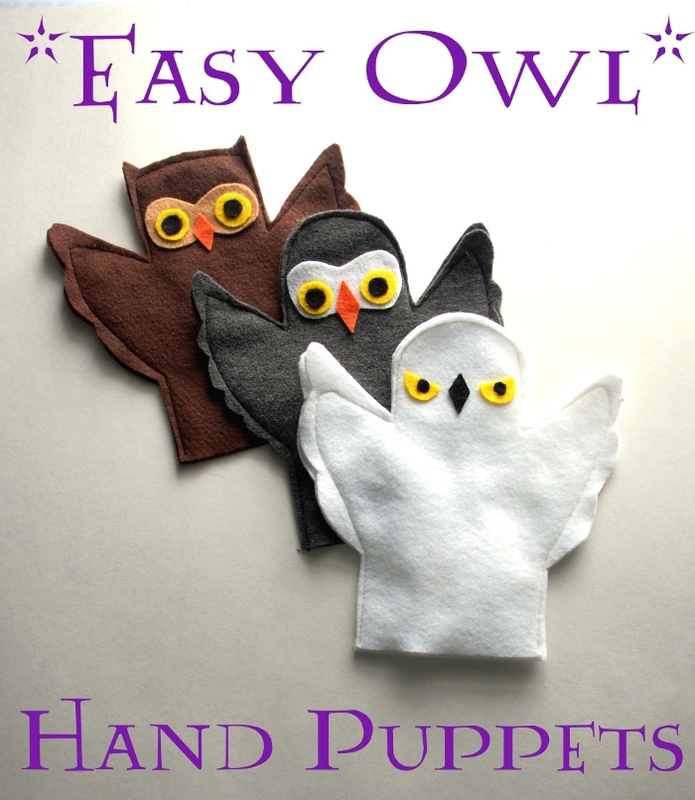 As I mentioned, I made twelve puppets but we were expecting up to fifteen children – I found a pack of six giant jumping frogs at the Dollar Tree and put those up as ‘toads.’ Most of the kids picked owls, but some did prefer the toads. If I’d had more time I might have done some kind of cat or rat toy (remember, Hogwarts students can bring an owl, cat, rat or toad) but I think most kids would choose an owl anyway. I think only two kids at the party chose the toad over the owl, but they were happy. Stay tuned! More Harry Potter-ness ahead! Linked up at Tater Tots and Jello!